The newest scent from Gonesh. Lucky #7 is perfumes of earthly wonders. May it bring you success and prosperity. 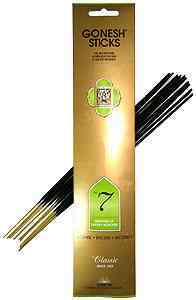 20 sticks of high quality charcoal incense, with a sweet and uplifting scent. Brand Information: Gonesh products are made with the highest quality raw materials. Gonesh's Incense has the highest charcoal content of any brand currently on the market - It delivers the purest, cleanest burn, and crystal clear fragrances.